Ginger-bread nuts 3 lbs. of flour, 1 lb. butter, 1 tea cupful sugar, 1 qt. molasses, 4 table-spoonfuls ginger, 1 small table-spoonful cloves, 1 " " " allspice, 1 " " " cinnamon, 1 tea spoonful caraway seed 1 tea spoonful soda, 1 qt. molasses, 1/2 lb. 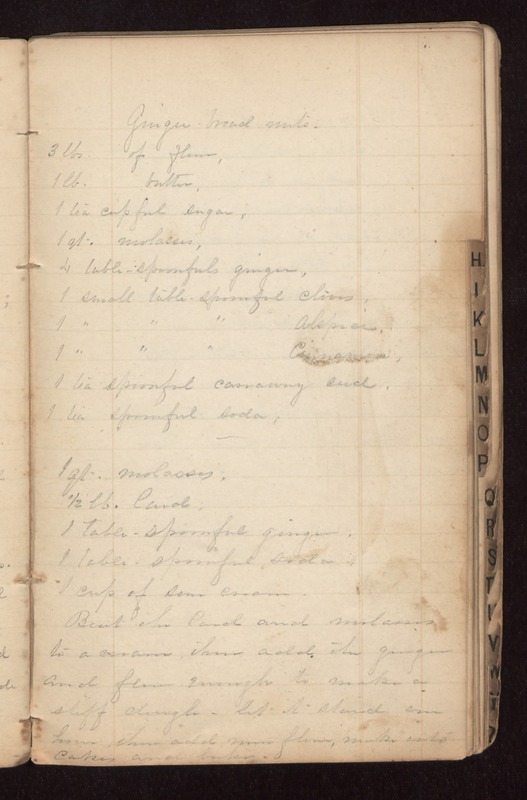 lard, 1 table-spoonful ginger, 1 table-spoonful soda, 1 cup of sour cream. Beat the lard and molasses to a cream, then add the ginger and flour enough to make a stiff dough. Let it stand an hour, then add more flour, make into cakes and bake.